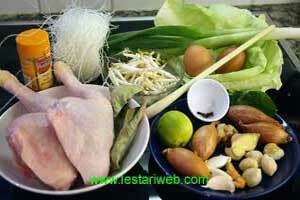 There are many different varieties of Indonesian chicken soups. 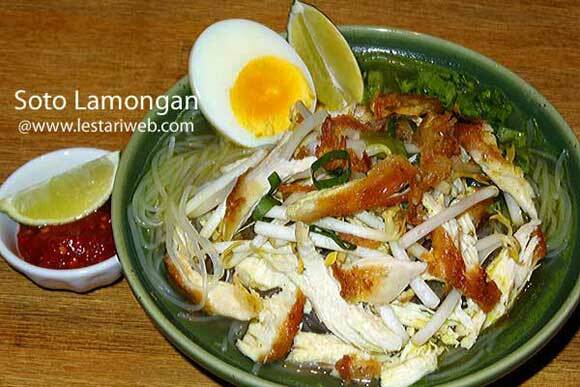 A famous variant amongs them is "Soto Lamongan". Originated in Lamongan city, East Java Province, this hot dish is now well known along the country especially in Java island. You can find this dish from street food hawker to top-end restaurants. Pour in 1.5 liter water in a deep saucepan, add 1 sliced galangale, 1 salam leaf & salt. Bring to boil. Adjust the heat into medium, *** add the chicken and simmer until the chicken well cooked. (If necessary skim off and discard the fat that floats to the water surface). Set aside to drain. Keep the stock. Put all ingredients for the spice paste in grinding stone or blender and grind/blend until smooth. (If necessery add a little bit oil in the food processor to help the blending process). Heat 2 tbsp oil in a frying pan (Don't add oil if already added in a blender during the blending process). 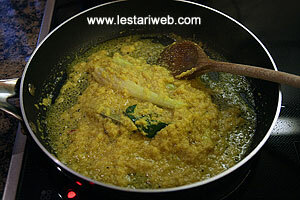 Add the paste, galangale, lemon grass, kaffir-lime leaves & salam leaf. Stir-fry the paste all the time until fragrant & well cooked. Note: The paste is ready when the colour changes from yellow to orange & the texture becomes scrambled, takes about 5-10 mins). Transfer the paste together with the herbs & leaves into the deep saucepan/chicken stock. Add the lime juice, chicken broth powder & cloves. Bring over medium heat to boil. Stir occasionally. Adjust the seasoning, add salt & sugar to taste. 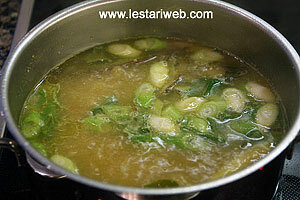 Add the sliced spring onions, cook briefly until just wilted but the soup should be kept pipping hot. Fried Chicken: Heat 500 ml oil in a frying pan and deep-fry the chicken until golden brown. Slice thinly. (If preferred you can deep-fry the chicken with Friteuse). Set aside to drain or pat dry with kitchen paper. Shred or slice thinly. Prepare all the condiment and garnish ingredients. 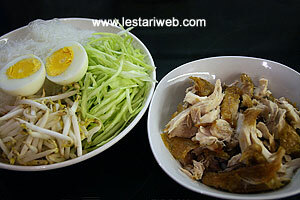 Serving Method: Put the glass noodle (or rice if used), sliced chicken in a individual serving bowl. Garnish with cabbage/lettuce, bean sprout & egg then ladle with the hot soup. Sprinkle with parsley & crispy fried onions. Serve with sambal rawit if you like it spicy..